Jacob Jonas never went to college, danced with a professional company or studied choreography. His performance background was limited to break dancing on the boardwalk in Venice, California with the Calypso Tumblers group, starting when he was 13. He was a passionate, hard-working and disciplined b-boy, and was asked to teach at a local dance school. In exchange, he was offered classes in ballet and jazz, and was intrigued by the dance forms. He practiced and studied for years on his own, and then scored an internship in Seattle with Donald Byrd, an award-winning choreographer. He also honed his photography chops, and started an ongoing project called #CamerasandDancers where select photographers shoot dancers in iconic architectural settings. And four years ago, this 26-year-old autodidact and innovator formed a dance company that combined break dancing, ballet, and modern dance. Now he is leveraging his skills, connections, and the power of social media to create and attract new audiences across the country. 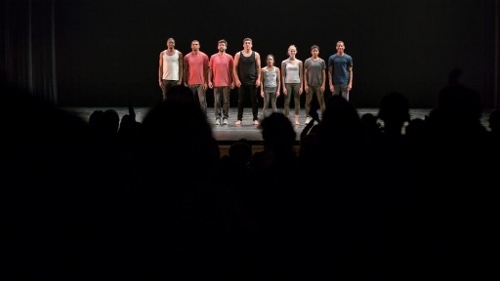 Lat night (May 3), Jacob Jonas The Company brought its kinetic energy to the stage at the Lensic Performing Arts Center in Santa Fe. 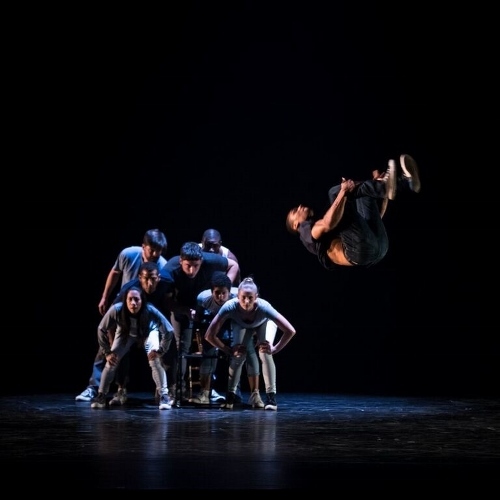 Advance publicity drew a large crowd of dance lovers who were curious to see how Jones blended street dance, ballet, modern dance, acrobatics, photography and film in four pieces with l0 dancers. Let me skip to the last piece: "Obstacles". It was one of the most moving, powerful, deep, personal dance creations I have seen in years. Briefly, it is dedicated to a woman named Mallory Smith who Jonas met when he was hospitalized. She was suffering, and eventually died last year from cystic fibrosis. They became friends, and Jonas, with his lighting designer, taped two hours of her speaking. She talked about wanting to give back, and about the private world she inhabited where she was manacled to her disease and could never get around it, ignore it, or forget it. On stage Jonas, who is a muscular and formidable presence, is the obstacle, the black clad disease, and perhaps also death. The woman, who is both physically and emotionally bound to her disease, is danced by the diminutive, and seemingly weightless Marissa Labog. We hear the taped words of Mallory Smith as Labog runs up against the towering Jonas, bangs into him, tries to get over him, around him, withdraw from him, escape from him, build up stamina against him, resist him. An implacable Jonas has his way with her, stolidly indifferent to her plight, always having the upper hand, bringing her to her knees, a rock of Gibraltar to her resourceful, seemingly undaunted, but ultimately doomed bird. Their pas de deux is gripping, breathtaking, deeply, deeply personal, and unforgettable. The other pieces— "In a Room on Broad St," which is about competition Jonas experienced, "especially in L.A."; "One Pair Off"; and a short film called "Grey," which was danced and shot at the J. Paul Getty museum– showcase the considerable talents and skills of the performers, which range from fluid, graceful ballet to acrobatics, breaking, modern dance, martial arts, and parkour. Of particular note was a stunning solo by Lamonte Goode. His tall, lithe body lunged for the ground, and he spun on his head in an act of hip-hop derring-do without using his hands for support. At times, he balanced and poised in yoga-like poses, and other times he was acrobatic, or stretched like Gumby from what seemed like one side of the stage to the other. 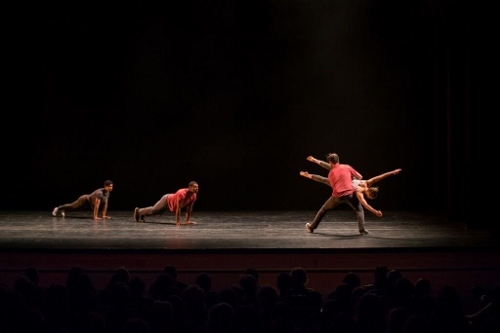 His total mastery of his body and Jonas’s shaping choreography made this a perfect and prolonged dance moment that brought cheers from the audience. What Jonas is trying to do in the evening’s program– blending dance forms that might be considered unblendable– is not wholly successful. Ultimately, the dancers have specific skills, and often multiple skills, but they cannot each do all the forms. 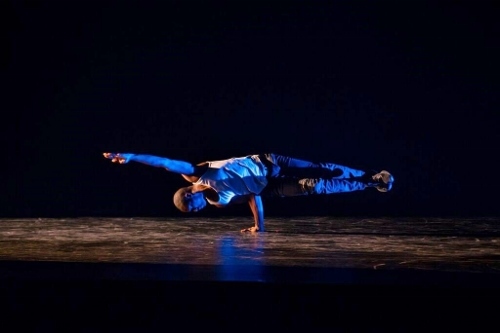 So you are aware of a piece being a street dance piece or a balletic or acrobatic piece, but they remain somewhat separate and don’t seem to interact with each other in satisfying ways. The company is fairly new, Jonas has a long and successful career ahead of him, and with his unique vision I hope he will be able to dazzle audiences with the interaction and not just the execution of the different types of dance. Jonas said, in an exclusive interview after the performance, that the dancers are learning from each other, so hopefully that exciting blending will happen in the near future. 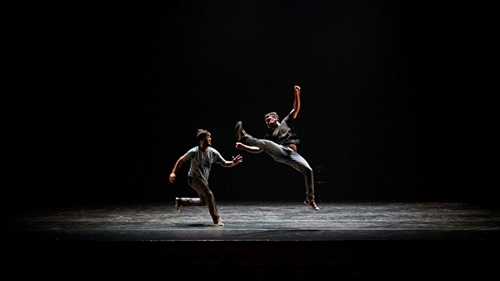 In last evening’s performance (Jonas has choreographed 12 pieces, so each performance is different and may weigh more towards ballet or modern dance), the street dance in the first piece sometimes seemed somewhat mechanical and redundant, and lacked the spontaneity of the street. In the film, the camera came in very close on the dancers, which was wonderful, but it never felt intimate and the dancers didn’t react in any meaningful way with the architecture. But "Obstacles" more than made up for any conceptual or choreographic shortcomings. And without any doubt, Jacob Jonas is a force to reckon with. Anibal Sandoval and Jacob Jonas.